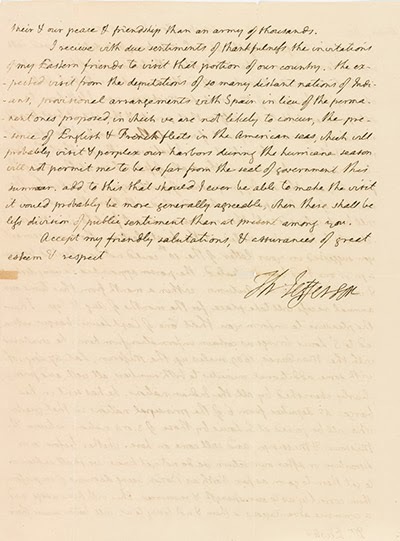 A historically rich and highly significant signed autograph letter from Thomas Jefferson to Dr. William Eustis of Massachusetts, a political ally, is being offered by Sotheby's in its Fine Books and Manuscripts, Including Americana sale, December 5, 2013. It is estimated to sell for $500,000-$700,000. 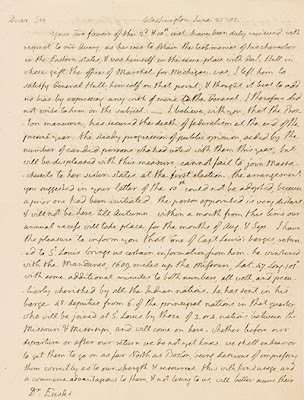 On two pages dated June 25, 1805, Jefferson, three months into his second term as President, refers to politics and the decline of the Federalists, news from Merriweather Lewis, information on the Indians encountered by the Corps of Discovery, receipt of a barge with Indian tribal deputies sent back by Lewis, the new Michigan Territories, trade with the Indians as a means to peace, negotiations with Spain, the French and British navies in American waters; it just goes on. 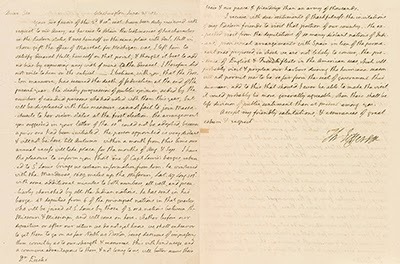 It is a supremely succulent historical document, bountiful Americana, and, further, one of only two letters by Jefferson discussing the Lewis and Clark expedition to come to auction in over sixty years. The letter was part of the collection of Lady Bird Johnson, former First Lady of the United States. Jefferson composed it on a bifolium of wove paper watermarked "J. Larking." Your two favors of the 2d & 10th inst. 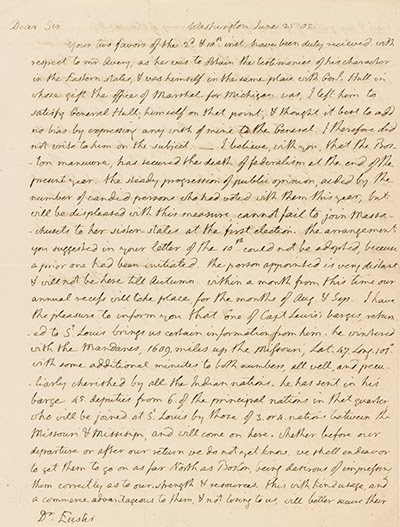 have been duly received with respect to Mr. […], as he was to obtain the testimonies of his character in the Eastern states, & was himself in the same place with Genl Hull in whose gift the office of Marshall for Michigan was, I left him to satisfy General Hull himself on that point, I thought it best to add no bias by expressing any wish of mine to the General. I therefore did not write to him on the subject. - I believe, with you, that the Boston maneuver has secured the death of federalism at the end of the present year. The steady progression of public opinion, aided by the number of candid persons who had voted with them this year, but will be displeased with this measure, cannot fail to join Massachusetts to her sister states at the first election. The arrangement you suggested in your letter of the 10th could not be adopted, because a prior one had been initiated. The person appointed is very distant & will not be here till Autumn. Within a month from this time our annual […] will take place, for the months of Aug & Sep. I have the pleasure to inform you that one of Capt. Lewis's barges returned to St. Louis brings us certain information from him. He wintered with the Mandanes, 1609 miles up the Missouri, Lat. 47 Long. 107 with some additional minutes to both numbers, all well and peculiarly cherished by all the Indian nations. He has sent in his barge 45 deputies from 6 of the principal nations in that quarter who will be joined at St. Louis by those of 3 or 4 nations between the Missouri & Mississippi and will come on here. Whether before our departure or after our return we do not yet know. We shall endeavor to get them to go on as far North as Boston, being desirous of […] them correctly as to our strength and resources. This with kind usage and a commerce advantageous to them, & not losing to us, will better know their & our peace & friendship than an army of thousands. I receive with due sentiments of thankfulness the invitations of my Eastern friends to visit that portion of our country. The expected visit from the deputations of so many distant nations of the Indians, provisional arrangements with Spain in lieu of the permanent ones proposed, in which we are not likely to concur, the presence of English & French fleets in the American seas, which will probably visit & purplex our harbors during the hurricane season will not permit me to be so far from the seat of government this summer. Add to this that should I ever be able to make the visit I would probably be more generally agreeable when there shall be less division of public sentiment than at present among you. Accept my friendly salutations, & assurances of great esteem & respect. Jefferson's mention of General William Hull refers to his recent (March 22, 1805) appointment of the soldier-politician as Governor of the newly created Michigan Territory as well as its Indian Agent. At the time Jefferson wrote to Eustis the Federalists (who lost the presidential election of 1804) were in decline, having little support outside of New England. They would not regain strength until 1812. William Eustis (1753-1825) was an early American physician, politician, and statesman from Massachusetts. A practicing doctor, he served as a military surgeon during the American Revolutionary War (notably at the Battle of Bunker Hill), and resumed his medical career after the war. He soon, however, entered politics, and after several terms in the Massachusetts legislature, Eustis served in the United States House of Representatives March 1801 - March 1805 as a moderate Democratic-Republican, the party of Jefferson. He later served as Secretary of War 1809-1813 under President James Madison. 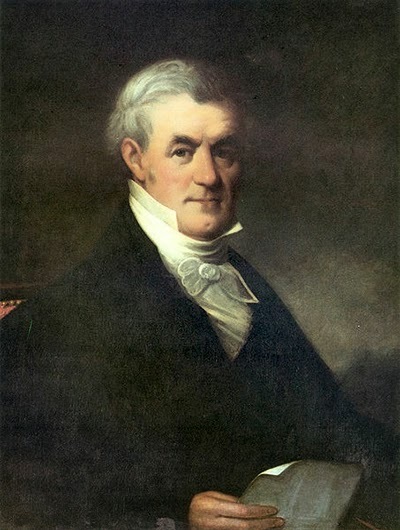 In 1823 he became the 12th Governor of Massachusetts.